Purple martins (Progne subis) are our largest swallow and very social birds. They flock together year-round and nest in colonies that may contain hundreds of pairs. Though highly social, purple martins are very territorial and will be aggressive to their own. When the males first arrive in the spring they claim many nest holes and sometimes fight over them to the point of grappling in mid-air, locking claws and falling to the ground, still fighting. The females arrive later and fight over the holes too, but when egg-laying begins the territorial lines are well drawn and the colony settles into a period of peace. Their condo living is so well settled that a bird may even defend his neighbor’s nest hole from an intruder while the neighbor is away. Fighting among themselves is not really a threat to purple martin well-being. The greatest threats are prolonged cold, wet weather and the invasive species who covet their nest holes. The cold wet summers of Hurricanes Abby (1968) and Agnes (1972) so suppressed the flying insects that purple martins eat that Pennsylvania’s purple martin population crashed for a decade. Starlings and house sparrows are ongoing threats because they want the nest sites. Their threat is best managed by the landlords who own (and must maintain!) the martin houses. If you’re interested in attracting purple martins to your area, contact the Purple Martin Conservation Association based in Erie, PA (www.purplemartin.org) or the Purple Martin Preservation Alliance based in the Alle-Kiski area (www.purple-martin.org). 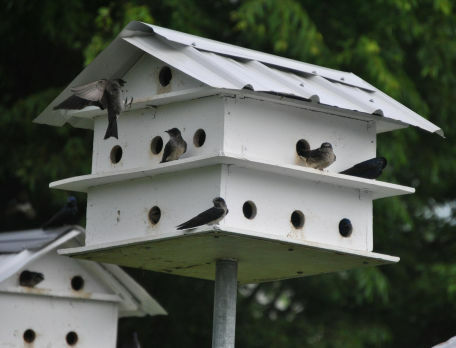 They’ll be happy to teach you how to attract and protect purple martins. Get help from an expert before you begin. The purple martin houses pictured here are in a colony in Everett, Pennsylvania, a town on the Juniata River. The colony was first established by a gentleman who set up three “apartment” houses many, many years ago. His backyard has plenty of open space and is near the river so there’s a good supply of insect food. His neighbor a few doors down set up the colorful gourds. And Marge Van Tassel took their picture last weekend on a PSO outing. 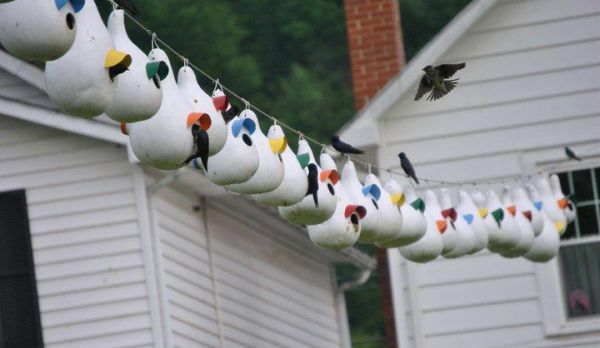 Quite interesting that Native Americans set up gourds for Purple Martins. Presumably to help control the number of flying insects around? Where did you find that information, Kate? I’d be interested in learning more.